I consider polenta to be one of my ultimate comfort foods. This simple cornmeal mush has been eaten and enjoyed for centuries all over the world. While we typically associate polenta with Italy, it is consumed in various regions and preparations. In France it became popular during the French revolution and was typically served with wild game and cheese or dressed with sauce. 16th century Portuguese brought cornmeal to Africa where it spread along Arab trade routes; it was fed to African slaves during transport because it was cheap and easy to transport. The Pennsylvania Dutch mix it with meat scraps. Romanians dubbed it mamaliga, serving it as a porridge or in small cake form. Romanian immigrants brought it with them to New York, where it became a common dish on Jewish deli menus. It Italy it is beloved both as a porridge and in cake form; it is sometimes mixed with buckwheat in a preparation known as polenta taragna. When maize was first brought by Columbus to Europe it was looked on with suspicion, even by Italians. However, it didn’t take very long for folks to warm to the concept of corn– it was easy and affordable to grow and could be used in a variety of ways. Formerly known as pulmentum, the ancient Roman name for pottage, polenta became a dietary staple for ancient Roman soldiers. They would eat their polenta rations as a hard cake or a porridge. Polenta grew in popularity throughout the centuries for its simplicity, affordability and delicious flavor. 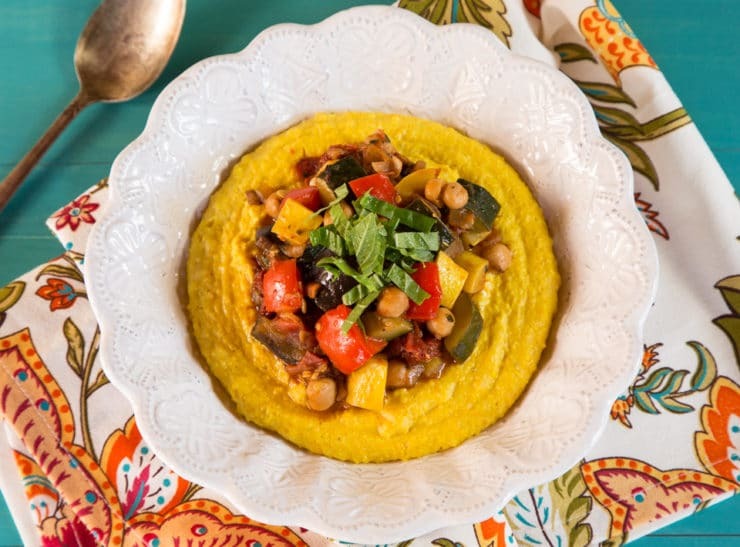 This polenta topped with a simple, flavorful Mediterranean chickpea ragout makes a filling and comforting meal. I’ve kept things vegan here, opting to add coconut milk and turmeric to the polenta for a creamy, savory flavor. Feel free to add parmesan to the mix if you’re not worried about keeping things dairy free. Enjoy! 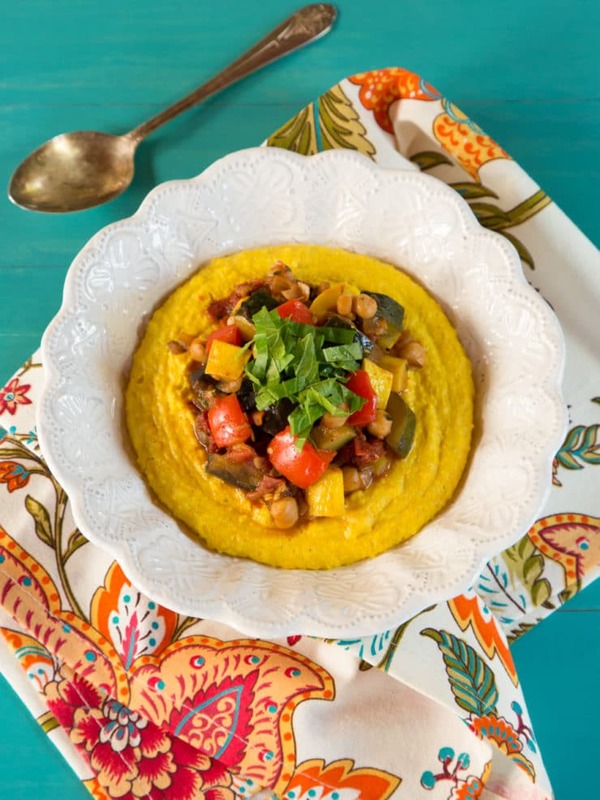 Heart-healthy, satisfying vegan entree recipe with creamy turmeric polenta and a flavorful Mediterranean vegetable ragout. Easy weeknight meal. For the ragout: Heat 2 tbsp olive oil in a large saute pan over medium high heat. 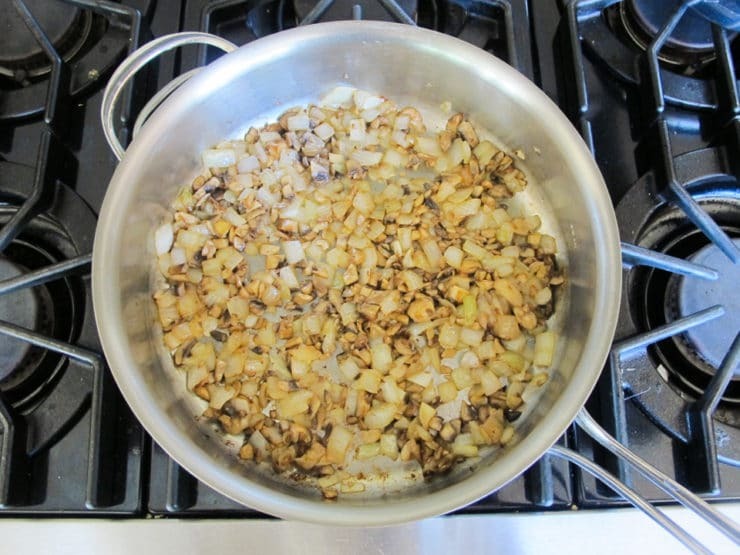 Add the mushrooms, onions and 1/2 tsp of salt. Cook until browned, then stir in the smoked paprika, cumin, crushed red pepper, coriander, cinnamon, black pepper and garlic; cook 1-2 minutes until fragrant. Stir in the balsamic vinegar, scraping the pan to remove any brown bits. Add the chickpeas and 3/4 cup water to the pan along with diced tomatoes, squash, eggplant, bell pepper and sun-dried tomatoes, stir well to combine. Reduce heat to medium low and cover. 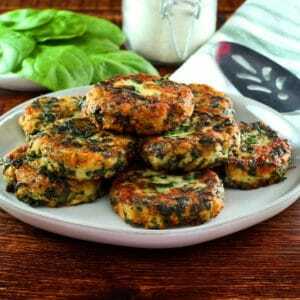 Cook until vegetables are tender, stirring occasionally, 20-30 minutes. Season with additional salt and pepper to taste if desired. Just before serving, stir in the fresh chopped basil. For the polenta: In a medium saucepan combine 3 cups water, coconut milk, 1 tbsp olive oil, turmeric and 1 1/4 tsp salt. Bring to a boil. 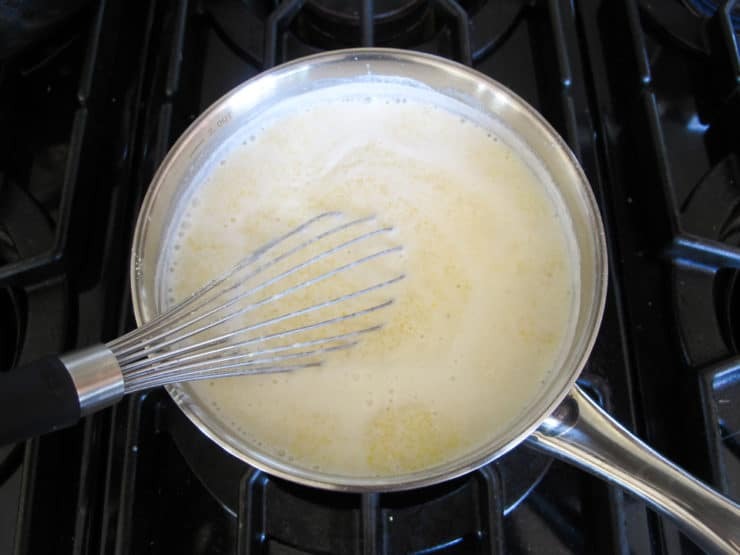 Reduce heat to a simmer and slowly whisk in the cornmeal. Simmer, stirring frequently, until the mixture is smooth, tender, and creamy, about 15-18 minutes. Serve the ragout over the cooked warm polenta. Garnish with additional fresh basil if desired. Fussell, Betty Harper. The Story of Corn. University of New Mexico Press, 1992. Great recipe. Will nourish the body and soul of some of my friends that are not feeling well. Thank you!! Changed it up a touch, converting polenta into arepas, and I added scallops… thanks for the inspiration! Too bad I can’t attach a pic! I made this because I am always looking for new and different plant-based meals. And it looked beautiful. But, I had my doubts. I am here to say the dish is beautiful and it is also delicious. My husband raved about it! My only changes were to roast the vegetables because I had the time and wanted to remove some water from them and we sprinkled about a teaspoon of feta on the top. Which was not necessary! So, this is a delicious, different, vegan dinner. And makes a ton. Hank you! I made your dish last night — part of my recent (4 month kick) to cook a plant-based meal every Wednesday (it’s a start) and, always, give credit to where I found the recipe. I have never made polenta before and have only eaten it once. In your recipe, you call for “fine ground corn meal”. I ended up buying corn meal that was labeled for polenta but was “coarse ground”. I compared it to the box of corn meal that I think every household has which does not specify the ground size — and it was clearly a finer grain than the one I had bought labeled for polenta. I think it turned out OK but it took about 45 mins to cook and wasn’t as creamy as the one time I ate polenta at a restaurant. Can you give more detail about the corn meal that you use for polenta? Thanks very much for sharing the recipe — it was quite good (and my wife loves that I am actually cooking & eating vegetables!). Thank you for this great recipe! My son is almost 2 and he also every last drop, we just loved it! I have made this recipe twice now. First time I made it for my daughter, who immediately went home and made it for friends. This week I made it to eat while watching football! Who needs Chili , I am not a vegetarian or vegan, but I love this meal as it is so flavorful. You may want to have enough ingredients around to double the Polenta, as the ragout makes plenty. Just made this. Delicious! Even our meat-eating son loved it. I always make a recipe without substitutions the first time, and there’s not much I would change except perhaps the spice amounts. We like a lot of flavor, so I will probably double everything next time. By the way, even though I am 61, I never made polenta before, and that I now regret! It was so easy, and tastes yummy. Thank you for the recipe. This recipe is KILLER. Man-o-man is it good! Your recipe sounds delicious, and I would like to try it. 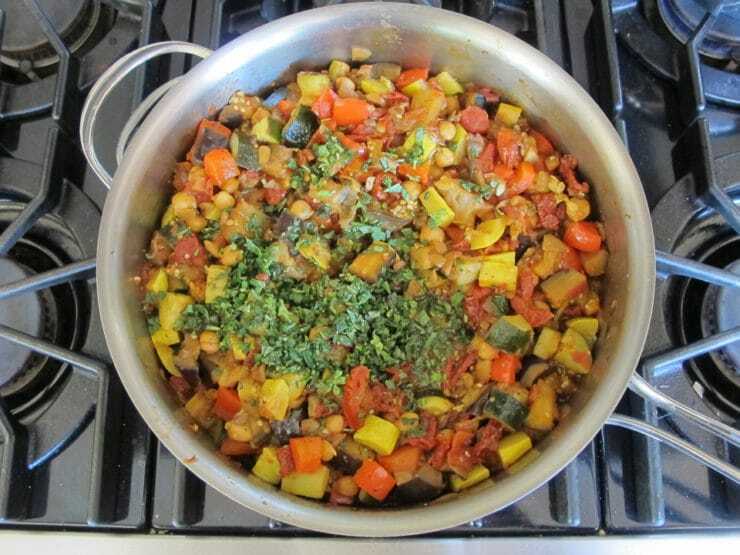 I love all the veggies in a ragout! Hi Lisa! I would say give it a try, it doesn’t have an overwhelming coconut flavor. With all of the other flavors to balance they might not even notice. Enjoy! I’ve made this multiple times for family and friends and it’s always a hit! Perfect! Absolutely loved this. Have tried it on meat eating family and they thought it was delicious too. Soo delicious! We enjoyed it immensely ?. Glad to hear that Mim! That looks so pretty. You have such a gift for presenting food in an appealing way. Awesome recipe, I did the polenta exactly as instructed…I’m convinced you could put a shoe on top of that and it would be delicious! Followed ingredients to the letter and perfection! 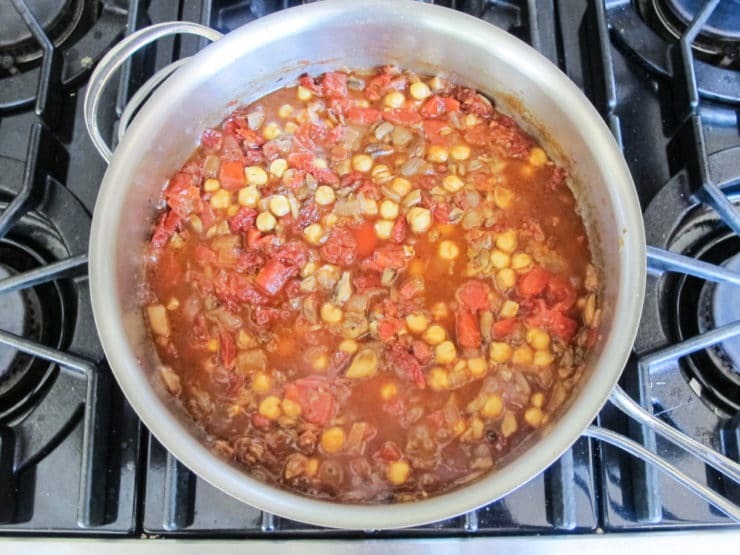 Like the previous review…I also had to cook ragout much longer than 15 min. I’m so glad I came across this recipe! Thank you! Thanks for the note Katherine! I’ve updated the cooking instructions, 20-30 minutes is probably more realistic. Appreciate the feedback and so happy you liked it! Followed the directions, turned out perfectly. Excellent favors. Garnished with some shredded Parmesan cheese and fresh ground salt and pepper. A lot of ingredients, so get everything done early and all laid out. Do the ragout first, then the polenta, as it tends to set up as it cools. Ragout recipe says 15 minutes; you may need more time than that. I upped the temp a bit after 15 minutes and cooked an additional 13 minutes or so. Definitely don’t want to over-cook it, though! Made this today with what I had on hand. No eggplant, yellow squash or sundried tomatoes. It was still AMAZING!!! Can’t believe how good it was. The coconut milk in the polenta was pure bliss. 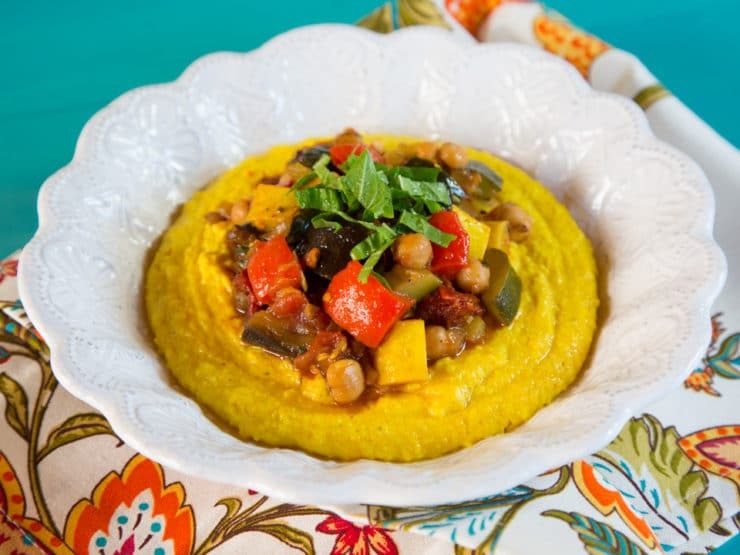 I felt like polenta for dinner this eve so I searched the web and came across this recipe. I have to admit I didn’t have a lot of the vegetables on hand so I made do with what I did have. I kept the spices exact. I only had zucchini, chickpeas, and sun dried tomatoes, so I added some other things I had: artichokes, kalamata olives, roasted red peppers and half a jar of a good quality tomato pasta sauce. This was phenomenal. The spices were amazing and everything just meshed together fabulously, and the polenta? I’ve never added turmeric or coconut milk to polenta before and WOWZA! Creamy and dreamy! My polenta has always been a little on the lumpy and dryish side but this was the opposite. Thanks for an inspiring meal! Keeper for sure. So happy you enjoyed it Trish! Deeeeeeeeicious.my vegetarian friends loved this one….polenta was smooth and creamy.yum!!! Thank you! My mom made mamalega, I’m so happy to finally get the directions. Can I substitute something (water? milk?) for the coconut milk? Alice, you can simply cook it with water, but it won’t taste as creamy. If you don’t mind adding dairy I would suggest adding butter and parmesan to the mix to help make it taste creamier. This sounds like a great vegan main course, however some of the vegetables are a bit ‘problematic’ (one of my kids won’t eat mushrooms or eggplant and another won’t eat tomatoes or peppers). Would you have any suggestions for substitutions? Cauliflower? Sweet potatoes? Thanks! 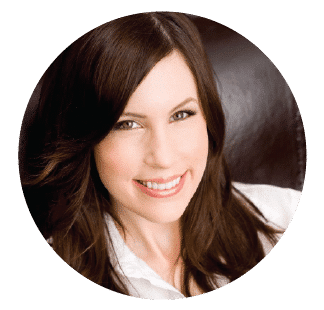 Hi Naomi– I hesitate to recommend so many substitutions in one recipe. One ingredient is one thing, but four will render it a completely different dish. I will say that you can omit the mushrooms without doing any damage (they simply add a more meaty flavor/texture), and you could probably sub additional squash for the eggplant and pepper. However, tomatoes are a pretty important part of the dish, so I’m not sure how to modify that part for you. If you give it a try let me know what changes you made and how it tasted. Good luck! Naomi, one of my sister’s kids also had problems with tomatoes when young. My sister substituted jarred roasted red peppers or if she wanted to use fresh, just cooked them down a bit in olive oil. I found some children like them even better if they’re peeled. A ‘y’ shaped vegetable peeler works well for peppers. Made this tonight along with your marinated lemon basil chicken breasts. Delicious meal! I halved the ragout recipe and still had enough for 4 generous portions. Tori, your recipes never disappoint. Thank you again. So happy you liked it Marry! AND THIS LOOKS GREAT ! We eat polenta several times a week for breakfast; we always make it with water. I don’t see any reason to use any kind of milk in or on it. Ruchama, I cook breakfast polenta with water too. I used coconut milk here to give it a creamier, heartier flavor which works well for a dinner-style entree. Looks so nice and delicious!!! 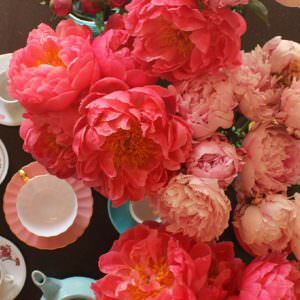 You share amazing recipes! Keep them coming! Thank you and perfect timing! I’m having a vegetarian friend over next week and this is what I will serve. Looks scrumptious as usual Tori! That looks amazing! Never put turmeric in polenta before but I love them both, and your pics make it look mouthwatering!